If you arrived here through the link on my Facebook page, you can follow this link to return there if you wish. I hope you’ll stay awhile and have a look around first. I’d love to get your reaction to my site & my work too. There’s a form at the bottom. I’d appreciate any feedback that can help me to improve your experience here. Here’s a sampling of my art quilts, to give you an idea of the scope of my work. I use a variety of techniques, fabric painting, mixed media, applique, thread painting and creative free form quilting. “Cherry Blossom Birds” silk painted, using creative thread painting. The birds are created solely with tread painting. “Jellyfish Love” A large commissioned art quilt. A large silk painting. The birds were appliqued ont The painting results determine the direction I take. he paints used are permanent, much like dye. Entire art quilt was thread painted. The moon has a trapunto effect. This original silk painted art quilt was created by Barbara Harms. “An Impressionist’s Garden” Silk painted and appliqued with hand painted silk fabric. I used thread painting to add a touch of whimsy and fun to the design. 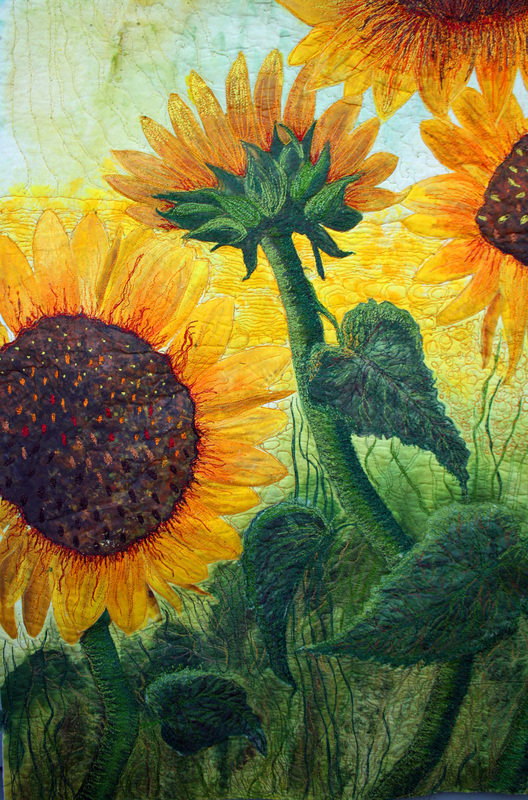 “Sunflowers for Cyndy” commissioned fiber art quilt by Barbara Harms. Silk painted, images created by thread painting and applique. Commissioned “A Bug’s Eye View”. Mixed media fiber art quilt “Down The Rabbit Hole”by Barbara Harms. Silk painting and creative thread painting used. “After the Spring Shower” Silk painting, applique and extensive thread painting used. I also do silk paintings. If you choose one of my silk paintings, I will mount it on stretcher boards or you for small charge for the upgrade. Your gallery is very beautiful. I can’t decide which one I like best. Thank you for sharing your amazing work. How nice of you to say so. What generous comment, thank you. The situations, I write about actually occurred., I do condense them [I know,not nearly enough] and add my semi humorous commentary [or so I think] but for the most part they are100% real. OR 98% might be closer. Oh look for the pic of my too funny husband in the post about our minion anniversary, that’s him.